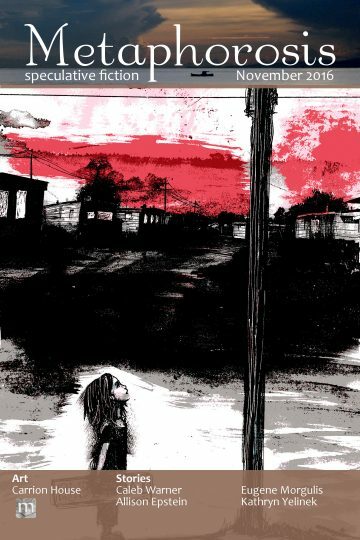 The girl returned to the abandoned trailer park with a road sign strapped to her back, a sacrifice for the man in the telephone pole. Cradled by the river, the trailer park sat, rusting. The entrance gate read Green Meadows, but the only green things left were the corroded copper-wire antennas and the piles of old road signs. Nothing truly green could grow in that black, clay-packed soil—even when the spring rains came and flooded the river valley. The soil liked to work its way in-between the girl’s toes and stain the back of her shift a crusted grey. When it dried, the soil smelled like some rotten pond thing, like how dead turtles smell. Now it was summer; the clay had gone to mostly hard-pack, and it was warm against her bare feet. The girl walked along the lane, kicking a white bit of gravel along with her, banking it off trailer walls and piles of twisting metal signs. In the center of the camp stood the telephone pole. The smiling face of a man peered through the creosote soaked wood. It was half carving, half prism, like the face was trapped there behind the wood. If one were to have this demon’s view—from above like a bird, as the girl had so often imagined herself—then Green Meadows would look much like the arching back of a cat as its corrugated shanties flowed along with the curve of the river and the slope of the land. One lane pierced the park down its center; a lane that connected Green Meadows to everywhere-else. The girl walked up to the telephone pole, and in the light of the setting sun, it cast a long shadow across her face. The frayed steel edges of the street sign nicked her hand as she held it up. A thin trail of blood raced down the rusted metal outlining the words RUBY ROAD. She made no move to clean it. She let it run. “I live by your good graces,” she said quickly. She didn’t need to hear it again, but the time away from camp was time for doubt. Ursula wasn’t ready to test her doubt quite yet. Wrapped around her waist, just under her pocketless shift was a hand-drawn map of the river valley with fresh charcoal scratches on it. Her one secret. Ursula tightened her grip on the sign. Her arms were shaking, and the blood on her palms made the metal slippery. “Leave it with me,” he said finally. Ursula let out a stiff breath and propped the sign up against the telephone pole. She stood with her head down and her hands folded. “And?” the voice shook Ursula somewhere down in her stomach. It made her feel dizzy. Ursula had to bite her tongue to keep her face still. Did he know about the map? “But I brought the sign,” she said. “The signs are far now … I-I’ll need the food for tomorrow.” It wasn’t a lie. She had never lied to him. It wasn’t the whole truth, though. Ursula would be ranging farther than the closest sign. The pause was long enough for Ursula to feel the blood start to dry and grow sticky on her palms, long enough for the purple light of the sunset to turn to grey. Ursula didn’t dare look up at the face. She didn’t move at all until it spoke again. “Fine. In the southeast corner. Off with you.” Then the sun fully set, and a bruised black night consumed the valley. The demon’s face went dark, its malice emptied like a used up inkwell. Ursula nodded and shuffled over there, keeping her head down and her strides short. A trailer without a roof, that’s where it had carted her off to for tonight. It had once been bright silver and could comfortably fit two or maybe even three people. Like everywhere else, the trailer was filled with signs, and Ursula was small enough to fit in the middle of it all. In the cleared area lay a can—with its label ripped off—and a can opener next to a dried cow pie and box of matches. The gift. Ursula maneuvered a few of the signs to give her a place to more comfortably sit without fear of injury. Only when her hand drew a fresh red streak on the trailer wall did she remember the cuts. Ursula left the trailer, went down to the river to wash up. The silty, dark water made the cuts sting but it was better than letting them get infected. Ursula had cut her leg pretty bad once on a sign and didn’t bother with it. A day later she got the chills. Two days and she stopped peeing, but was ravenously thirsty. And the third day Ursula only remembered in small snatches of clarity, everything else fuzzy and distant like an old dream. The fourth day she awoke under the telephone pole without a memory of how she got there, but she was fine, a bit groggy, but the cut on her leg had healed and she was hungry again. She guessed infection must not be deadly, but she didn’t want to go through any of that again. It wasn’t long after cutting her leg when Ursula had started making the map. She took a few sips from the river, watching her murky, moon-lit reflection in the water shift and move with the ripples of the current. There was a blurry little girl trapped just under the water there, just like the man in the pole. Ursula could almost reach out and touch the girl, but not quite. Returning to the trailer, she situated herself among the signs again and lit the cow pie. It wasn’t warm enough to heat the can, so she ate its contents—beans, it was always beans—cold. Ursula had very few memories from the time before Green Meadows, but the memories she did have were hidden in certain tastes or smells or the occasional image. It was mostly taste, though. The beans were that wrinkled person with the bright smile and soft, blue eyes. The smell of burning cow pie was the starry night sky and open fields. They weren’t really memories as much as feelings of memories. She huddled around that smoldering cow pie, drawing her shift down over her knees, shivering. The cold night made her back hurt, but on clear nights like this, she could see all the stars in the sky. She traced the constellations with her eyes. It helped fight the chill. Big Bear, ladling the black soup of sky into Little Bear that spun round and round on the North Star. The unmoving star always sat right above the telephone pole, no matter where she looked. She wondered what kind of place ‘North’ was and how long it took to get there. Maybe her map would include North. Maybe when it was complete, the map would point straight there. Ursula became very aware of the paper-thin cloth tucked away under her shift, and she looked at the stars now without seeing them. Though her eyes still drew lines between the bright dots, her mind was drawing the lines of her map. The river. The bridges it crossed under. The lines of roads that lay over the land like a net. And the faded emptiness of everywhere-else, all the places Ursula had never been. God, how she wanted to look at the map now, to see the lines and reassure herself of the places she knew, forget about the everywhere-else. She couldn’t. The man would see. She had little way of knowing if the man in the pole had seen already and was just playing along, waiting for another time to take away her food or make her sleep without fire in the lonely black night. But she had to believe that he… that it didn’t yet know. Without the map her eyes were drawn to the dark spaces between the stars of Big Bear. The dots made the semblance of a shape, but no matter how many lines she drew in her mind, there would always be empty spaces between the stars. Nothing could bring one to the other. No star would be free of the empty black that surrounded it, and Ursula’s map would never be free from its faded edges. Ursula shuddered and drew her shift tighter around her. She slept without dreaming that night, curled up in the fetal position, sucking her thumb. She woke once just before dawn and almost called out to the man in fear. There were no stars in the sky above her. On her back, looking up out of the roofless trailer, Ursula felt like a big, black blanket lay on top of her, suffocating her. She knew it to be just the darkest part of the night, but she slammed her eyes shut anyway. Still the blackness remained until it took her into sleep again. In the bright morning she forgot the moment like you might forget a useless dream, rubbed away as easily as morning eye-crust. Dream forgotten, she left camp to go find another sign. Watching Ursula’s back shrink as she left camp always dredged up that same unpleasant memory, but he had grown used to waiting, in the daylight at least. That black emptiness that came with night might just drive him to destroy it all, end it all. The girl would return, though, and her bright little face would somehow calm him enough to go one more day. She had been taking longer and longer to return, and he entertained the idea that maybe she would never come back, just like the rest of them. He had only been a little boy then. They had left a useless, dependent little boy. There was no reason for any of them to come back. His uselessness had been weakness, and he understood. When the diseases came—after the collapse—they had had to leave weakness behind. Now he was useful, though. Now he was the God of this domain. He saw every crevice of every trailer. Every grain of sediment was under his control. Things could come into being because of him. Things could be destroyed too. It had been his death in the light of the covenant between father and son that had made him powerful, made him useful. And now Ursula could not leave him. She couldn’t get food, couldn’t find shelter. Not on her own. No, she had to stay with him. These thoughts and more whirled around in what remained of the man’s mind as he watched Ursula’s back fade out of camp. The camp is full. People pace around through the muck. The camp is the world, and we are all continents moving on mud lava. The camp is the whole universe, and we are galaxies circling each other, colliding, drifting apart. It is all drifting apart. “He made it all?” I point up and try to grapple at the stars. The rest of the memory is stars and indistinguishable babblings of the river. But the river fish stop biting, and people need to eat. It don’t matter if they’re galaxies or not. They eat the grass before they resort to eating the mud, and they collide, breaking apart. Clothes are torn from their clotheslines, thrown into hasty rucksacks, as they drift into some kind of nothing. And it is all collapsing. The real world. Collapsing again. It all burnt up once, but some things got rebuilt. Now it’s burnt up again. Second memory: Just voices. Miss Lenore’s, telling me that there are only two things in the universe, Push and Pull. Daddy’s—louder, more like sandpaper and corrugated metal—tells me that there are only God and his rotten angel Lucifer. Still others yelling about more practical things like food and water. “Leave, then,” Daddy’s voice again, “but he will punish you. Punish me too, for failing to prepare the kingdom. Heck, he’ll punish us anyway. We been bad alright.” These voices taste like sulfur. They are leaving. They’ve been leaving since they got here. Push and pull. Daddy is pull. Miss Lenore, push. The spaces between us all are growing as things push and pull each other apart, and only footprints are left in Green Meadows. The universe empties. The continents drift into the black. There’s just me and Daddy. We are the universe. We are God and Satan. Push and Pull. “Something that can never be broken,” I say. “Now you’re in charge of Green Meadows while I’m gone,” he says. Then Daddy’s back fades out of camp. I wait. I see the mud gobbling me up. It’s up to my knees now. No, my waist. No, I can taste it if I stick my tongue out. Things go black for a second, and I see the grit in the clay, the spaces between the bits of dirt and mineral. I guess this is where I die. I remember it hurting. Maybe I’m buried here forever, or still here, but now I see the camp from above like a bird. I can’t move, but I can see. I can’t feel, but I can think. I can remember. After what might be long while or not too long at all, I become convinced that this is my hell place. A big empty trailer park for all eternity. Then Pull brings an old man and his granddaughter to camp, and it’s real. All of it has been real. Which means Daddy’s real and still out there. And I remember that I promised. A promise is a powerful thing. Powerful enough for gods. My Last Memory: A bargain. I tell the newcomers that I am looking for a sign. The old man tells me that they are looking for a place to stay. He and his little granddaughter had been traveling from one empty town to the next. In need of food, water, and a place to hide from the disease, I offered him a deal. For every sign he brought I would give a can of food and a place to rest his head. He agreed and filled Green Meadows to the brim signs. He died some time later. So I raised that girl, taught her to go look for signs when she got old enough. I won’t leave her like my Daddy left me. Like her Granddaddy left her. Ursula’s map lay open on the ground, charcoal scratches depicting a new box. All unfolded, the map was wider than she was tall, which wasn’t saying a whole lot, but it had started as a piece no bigger than her hand. The cotton patchwork had grown as her knowledge of the valley did, stitched together with thread pulled from her shift and a thin bit of tin can for a needle. Now, on a hill overlooking new territory, Ursula drew what looked important with the charry remains of her cow pie. She also freshened up some of the older lines. If she put it down on the map then she didn’t have to remember it, and she didn’t have to fear the empty spaces so much. Green Meadows was a half-a-day’s walk away. The weight of the demon’s gaze gone, Ursula found herself feeling very light. She might float away if she wasn’t tethered down to the map. She finished up her drawing by extending the line of roads, not thinking about the new empty edge that finding more places always created. Ursula sat back on her heels, felt the grass, soft but scratchy beneath her. The sun burned hotter overhead. It had just passed midday. The house below was known now. It was on the map. She could go to it without any fear. She heard the demon’s voice saying “Only signs. Nothing else,” but it wasn’t the real voice, just the one Ursula’s mind made up. The made up one never made her feel sick, but still, the thought of him made her crash back to earth. But she had never found anything like a house before. It was all just fields of grass, sometimes woods, but always gravelly roads with their signs. Something about seeing the house—complete with a roof and a door—filled Ursula up with bright colors. It made her forget about how metal always had a sharp edge and that you couldn’t really get all the mud out from under your toe nails. The demon couldn’t see this far. He’d have taken the map if he could. She folded the map up with the bits of char and raced down the hill. She’d prove it—find out right now if it could see her all the way out here. The inside of the house was an empty space, after all. She had to see inside to fill out her map properly. The house was as empty as its drawing, but it was still beautiful with its brick walls and unbroken glass windows. The only mud in the house had been tracked in by Ursula herself. There was one thing in the house, but Ursula didn’t know how to put it on the patchwork map exactly. Coming across it made her forget how to breathe for a few seconds. On the wall in a smaller room to the back of the house was an image of herself. Ursula recognized the shift and the black mud. She did not recognize the face. Its shape was familiar, but the clarity of it was new. Ursula touched her face over and over again, head buzzing. Ursula’s stomach rumbled and ached. Last night’s meal hadn’t gone far, and her belly was empty. She glanced out the window, saw the sun starting its fall. On her map she drew a crude picture of herself inside the house. In it she was smiling. Coming back to camp, with the map tucked safely up under shift, the girl had wondered how lying to the demon would work. She could not remember lying to it before, but she could also not remember having gathered all these signs that piled and rusted around her. But lying to it … that felt like something she shouldn’t do. So for the first time, going in blind, the girl felt her way through the lie, ignoring every instinct, “I didn’t find any signs this time. That’s how come I was so late.” The words came out of her mouth new and awkward. “Nuh uh. Lying will rot your teeth out,” the demon said. Ursula couldn’t nod her head one way or the other. But she had a pretty good idea. “A sign, a sign!” was all Ursula could say, “I’ll get it, I’ll get it.” The pain in her head was enormous and voice inside her body made her muscles twist and jump. When Ursula opened her eyes, three open cans of beans lay in front of the pole. She ate them under a pitch black sky. The next day, Ursula ran back to the empty house. She made it in half the time it took the day before. She stood heaving heavy breath with her second self. She could think clearly here. It hadn’t killed her—had let her leave camp even—but a twisting just beneath her breast bone meant something bad was stirring up. It might kill her today, one way or the other. It hadn’t known about the house, though. Her doubt had been muddy like the river before now. Now it was clear. It was like the wall that showed things for what they were, showed Ursula her pondering face, showed that the demon had limits. And if it had limits, if it couldn’t get her, then what was stopping her from leaving? “It can’t reach me,” Ursula said. “It can’t or it’d yell at me. Hurt me. It can’t get me.” She said it over and over to her reflection, and her reflection said the same back to her. “It can’t get me.” She stayed there until the sun set. When the sun set and Ursula didn’t return, the demon summoned a storm. He was in charge of the Meadows and that meant the sky that covered it too. All of it was his, and his Daddy put him in charge of it. His anger burst like a flooding river, bursting like a thousand dying stars. He wouldn’t let her leave him in this empty camp alone. He didn’t deserve it. Not again. Not when he was useful. Not when Green Meadows had deigned to make him their God. The storm clouds gathered over him as the first of the stars began to peek out. The North Star burned bright, but it wasn’t bright enough. The clouds turned the sky, and the land below it, to a deep-set shade of purple, then green, then black. A pile of signs toppled over as the ground shook. Trailers ripped themselves apart in the winds. And the demon felt himself rising, rising. He was the storm now. The land shrank away, and he saw it all, reading it like a map. Thunder shook her awake. The wooden floorboards beneath her rattled. A flash of lightning bleached everything for half a second and left green after-burns in Ursula’s sight when it all went black again. It was raining outside. Ursula could hear the wind raking itself across the bricks like claws. Ursula curled up into a ball, the howl of the wind growing louder and louder. The front door groaned on its hinges until it burst open, rain water flooding in. She backed herself into the corner, looking over her shoulder, trying to see her reflection one last time before it took her. Flash of light. A scared little girl. That was all she saw. The thunder that came not moments after shattered it all, and she screamed. She felt like she was being pelted with broken bits of herself, and the cuts they left were deeper than anything a ragged sign could do. The wind ripped the roof off and tossed it about like so many sheets of paper. The rain soaked her to the bone in an instant. Another flash of lighting, and up in the sky she saw the storm’s face, with its pupil-less eyes and red-lipped scowl. And then the wind picked her up like an infant, lifted her as it lifted the house, but where the house fell away, Ursula stayed, cradled in the wind. One last blinding flash, and she saw the demon’s face again in the clouds. Spinning and spinning. She had to stay with him. She had to. Yes indeedy. Oh, she’d been bad and he’d bring her back, but spinning and spinning. She didn’t deserve to come back. Betrayed him. Left him for someplace else. Like everyone else. She couldn’t. How would she eat? He was useful. He lit the sky with the thought, lightning like new synapses for his brain, and saw Ursula’s limp body being twisted in the funnel of black clouds. It was only an instant, but he saw her pale face. Serene. He wondered how his face had looked when Daddy had left him. Had she been … happy here? But no food, no water? How could this empty place make her happy? A place so devoid of signs. A place so useless? Yet she was ready to defy him over it. The storm floated back over Green Meadows. The man in the storm saw the shanties, and the river, and piles of rust—all strange constellations in their own right—and the now-empty pole watching over it all. Rain poured down, driving into the ground and turning the hard-pack soupy. Rivulets ran in a thousand tributaries all converging at the pole, moving towards the one constant. From above, it looked like the crude drawing of a bursting star, with mile-length rays. The man, the demon, whose name had been forgotten, who was the last promise from a twice-dead world, laid Ursula down in a soft cradle of mud beneath the telephone pole. He couldn’t do what he’d thought he could. Not to her. It all came down to waiting, and she had nothing to do with that. He was tired of waiting—for Daddy, for change, for the right sign—he screamed his fury into the storm, and he broke his vessel in two. Then he faded into the black, where he hoped his Daddy might now be waiting for him. Morning came, and the girl uncurled herself. She felt around on her body. Alive. Bleeding but alive. She crawled out from under the wreckage. She was back in camp, or what was left of it. She recognized the mud, and the bits of old metal were as familiar as the shape of her own hands. But the camp was hardly there. Trailers were ripped in half; some were gone. The rising river had washed all the road signs away, and all that remained were the lucky little shanties that had been built with concrete. She looked back. Snapped off at its base, the telephone pole lay in the muck. The spot where the girl had landed, just under where the pole had snapped, was curiously dry and free from debris. Her map was there, wadded up into a sopping wet ball. When Ursula opened it up the markings were gone, washed away in the rain. She dropped it, and it fell to the ground, an empty bit of patchwork. She sat down in the mud and cried until the stars came out. They came slowly, as each peeked out one by one—like pricking holes in the black with a needle—until the sky, immolated in an endless sea of burning white lights, nearly burst with stars. The North Star came out last, burning brighter than all the rest. The signs had all been carried down the river, and even the telephone pole had snapped, been brought low, but that star had not changed, had not moved. Ursula wiped her nose and reached a hand to the sky. She told herself that if she tried hard enough, she could almost just reach it. She couldn’t, but it didn’t matter. Down on Earth everything—the signs, the maps, the little girls—washed away in mud and silt, but not the star. It would wait for her forever, unchanged. Ursula closed her eyes and breathed deep the night air of the trailer park, then she picked up the wet remains of her map and left, following the North Star out of Green Meadows.